Horror-comedies, when done effectively, are some of the most entertaining and physically draining cinematic experiences one can have. When it comes together the way Sam Raimi nails it with Evil Dead 2: Dead By Dawn and Drag Me To Hell, you can be flicking between tension, laughter and shock, and sometimes all three within the span of a minute. Although Raimi is the most recognized name in the horror comedy genre, Drew Goddard made a name for himself in 2012 with The Cabin In The Woods, a twisted and imaginative film that was pitched just right with a beautifully understated marketing campaign that gave away nothing. The Cabin In The Woods features a fivesome of unsuspecting teens who decide to spend their summer holiday at a log cabin, not unlike the one from Evil Dead. In fact, its practically the same location. Dana, Holden, Marty, Jules and Curt barely get settled in when they begin to notice that all is not what it seems in this place. If they’d been paying attention, they would have noticed that a bird flying over their campervan along the way appears to hit an invisible forcefield in mid-air. The other clue that we get that this is not your average horror film is the interspersed scenes with two lab researchers, played by the excellent Richard Jenkins and Bradley Whitford, who appear to monitoring the teenagers from a bunker far away as though they are a lab experiment. They follow and scrutinize the teenagers with great interest but we do not yet know their intentions. Thats maybe more than you need to know if you haven’t seen the film. Although most of this happens in the first ten minutes. The Cabin In The Woods then straps the audience for a hilarious, intermittently scary and highly imaginative journey that would be a shame to spoil. This is definitely a film where the less you know going in, the better. 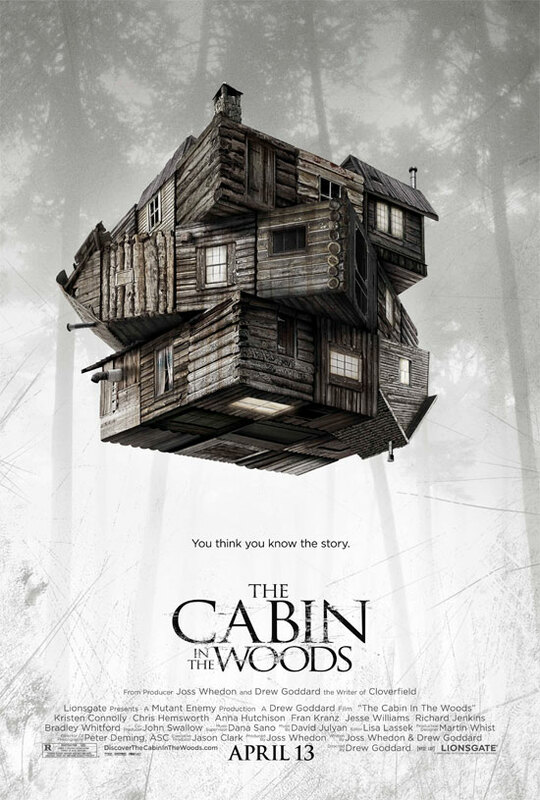 The beauty of The Cabin In The Woods is that it knows its audiences and enjoys toying with their expectations. You gotta know the rules to break them and Drew Goddard shows a sound understanding of horror tropes and conventions. Think you can guess who’ll survive to the end? Guess again. The film continues to push and pull in unexpected directions and is virtually unrecognizable in tone and atmosphere from the opening credits to where it finishes up. Conceptually, it reminds me of those old Road Runner cartoons where he runs so far to the right of the screen that he clears the filmstock and lands in a different show. Horror comedies are hard work. Its why I suspect so few people give it a go. You can be too focused on humour and undercut the tension in the horror scenes. You can fail to build tension and scare your audience if the humour distracts or doesn’t hit the mark. The Cabin In The Woods is one of those rare instances where it hits the mark on both counts. This is a genuinely scary and funny film. It has a rich understanding of horror film heritage but brings with it a fresh and interesting take. Summary : An entertaining and genre-bending horror film that is best enjoyed with as little knowledge of the film's contents as possible before viewing.